Nonviolence is a way of being, one we should begin building in early childhood. 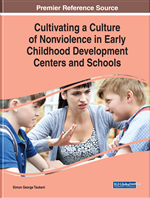 Early childhood development centers and schools can and should play a critical role in cultivating the spirit of nonviolence through curriculum, program design, parent-teacher interactions, peer-to-peer role modeling, and every interaction with children. Early childhood education (ECE) can play a pivotal role in supporting attributional development of both teachers and families in cultivating the spirit of nonviolence. This intrapersonal and interpersonal development is essential for the creation and sustainability of a culture of nonviolence in ECE programs. In this chapter, the author examines nonviolent attributes at the intrapersonal, interpersonal, and institutional level to create a culture of nonviolence from the inside out. Special attention is paid to the attribute of humility and how cultural humility principles and practices foster the skills of and commitment to nonviolence. Recommendations for promising practices and professional development are provided. First, it is important to distinguish between cultural humility and cultural competence as two approaches to ECE professional development that aim to create nonviolent-centered teaching and learning spaces through anti-bias and inclusive education. Cultural competency focuses on providing practitioners with culturally specific information about racial and ethnic minorities and includes the following four stages: cultural destructiveness, cultural incapacity, cultural blindness, and cultural pre-competence (Cross, Bazron, Dennis, & Isaacs, 1989). Cultural humility is a way of being with self, others, and the institutions we navigate. It asks not only that we assess our environments and engage them in a nonviolent and unbiased manner but also that we reflect deeply on who we are and how we show up, and the conditions we co-create that result in harm or reduce social harm, including both symbolic/structural and interpersonal violence (Blanchard, Yeh, Johnson, Schlierf, Dixon-Washington, & Lee, 2018; Vesely, Brown, & Mehta, 2017). Culture of Care: An environment in which schools put equal or greater importance on relationships than on curriculum. Reflexive Inquiry: A process of inquiry rooted in self-awareness, situational understanding, personal filters, and social location. Symbolic Violence: A form of systemic oppression through perpetuating stereotypes, limiting multiple forms of discourse, devaluing indigenous or cross-cultural forms of wisdom, and maintaining invisible rules that advantage some while disadvantaging others. Conflict Transformation: Intentional effort to address conflicts that arise in human relationships. Skilled Dialogue: A process of communication that is not agenda driven or debate centered. Microaggressions: Nonverbal and verbal expressions that communicate hostile intent based solely on the target individual’s marginalized status. Identity Negotiation: The process of coming to agreement regarding the identities individuals assume in interactions. Cultural Competence: The ability to interact effectively with and deliver services equitably to people of different cultures.